Texas Groundwater Resources are critical to meeting our future needs. Water is one of State’s most precious resources. Groundwater derived from many aquifers supplies over half of the water used in the State. Protecting the quality of this vital resource is the responsibility of all Texans. For many years groundwater has been pumped through water wells. Over the years, many wells around homes, farms, industrial sites, and urban areas have been abandoned without being properly plugged. Not only are these wells potential groundwater-contamination avenues; many are a safety hazard to children and animals. Although plugging an abandoned well takes time and money, these wells are a threat that can no longer be ignored. Texas law makes the landowner responsible for plugging abandoned wells and, therefore, liable for any water contamination or injury. This publication is provided to help landowners understand how to plug a well properly. 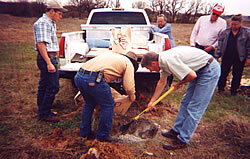 It is highly recommended that before you begin the process of plugging an abandoned well that you seek advice from your local groundwater conservation district, a licensed water well driller in your area, or the Water Well Drillers Program with the Texas Department of Licensing and Regulation (TDLR). Abandoned Wells are a Threat to Our Water Supply. 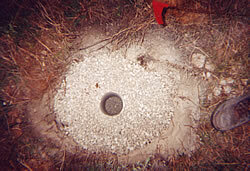 An abandoned well is a direct conduit from the surface to the aquifer below. Contaminants that enter the well are introduced directly into the aquifer with no opportunity for natural filtration by soils or geologic materials. If a contamination incident occurs with a concentrated chemical, the potential for health-threatening levels in the underlying aquifer is high. This puts other wells in the aquifer at risk, particularly those wells on the same property or those that are close to the abandoned well. A well open to more than one aquifer will allow water to migrate out of a zone with higher pressure head and enter a zone with lower pressure head. In many areas of Texas, deep aquifers are under high pressures and are extremely salty. When the casing from a high pressure well deteriorates and the well is abandoned without proper plugging, continual upward flow of salty water from the deeper aquifer will cause contamination of the shallow, fresh aquifer. Also, any pollutants that occur in the zone can migrate to another zone through the well. Pressure head in artesian aquifers is depleted as water discharges either at land surface or to less pressurized aquifers. Unplugged abandoned wells contribute to the regional depletion of pressure head within an aquifer. Eventually the decline in pressure head causes flowing wells to stop flowing and the water level in nearby wells placed the same aquifer to decline. When is a Well Considered Abandoned? If you are uncertain whether your well is legally abandoned, call a licensed water well driller in your area, the Water Well Drillers Program of the TDLR, or the local groundwater conservation district (if one is present). How can you take care of an abandoned well? An abandoned well can be fixed in three different methods. The first method is to return the well to an operable state by making sure the casing, pump, and pump column are in good shape. The next method is to cap the well in a manner to prevent surface water or contaminants from entering the well, having a cap that can support 400 pounds and making sure the cap cannot be easily removed by hand. The third method is to plug the well from the bottom to the top with bentonite, bentonite grout or neat Portland cement. Who can plug an abandoned well? The three people who can legally fix an abandoned well are the landowner, licensed well driller, and licensed pump installer. Landowners are limited to the simple well construction methods and to wells with less than 100 feet of standing water in the well. 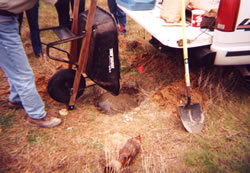 As the landowner, you may do the work necessary to plug an abandoned well on your property. If you plan to do so, first notify the Water Well Drillers Program of the TDLR of your intend to plug the well and the method you will use. You should also request a State well plugging form. Within 30 days after the well is plugged, you must send a copy of the form to the TDLR. Also, send a copy to the local groundwater conservation district (if one is present). If the well is within a groundwater conservation district, notify the district of your intention to plug the well. Request the district’s plugging application and apply any applicable fees as required. Seek the district’s professional consultation regard any other compliance issues to be considered. 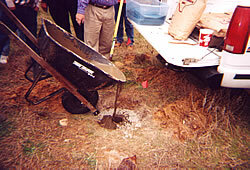 You can hire a licensed water well driller or pump installer to seal and plug an abandoned well. In some cases this is recommended, because a well contractor has the equipment and an understanding of soil conditions that affect how the well should be properly plugged. What are the steps in plugging an abandoned well? Step 1. 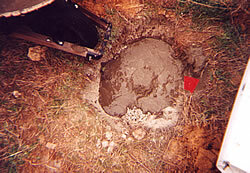 Determine size of well. Measure the dimensions of the well. 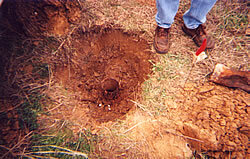 Measurements must be taken of the well diameter, depth, and water level. Accurate measurements (not estimates) will allow the correct calculation of the total well volume and the volume of water in the well. This information is needed to determine the amount of materials which are needed for plugging. Step 2. 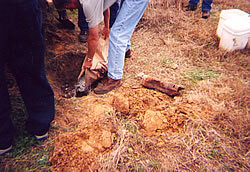 Remove debris from well. Remove all obstructing materials from the well. It is critical that fill materials do not slump or settle; therefore, obstructions that may cause incomplete filling of the voids must be removed. Remove the pump, pump rods, pipes, and any other equipment from the well. Floating debris, such as wood staves, should also be removed. Step 3. Disinfect the well. Disinfect the well by adding household bleach. It is recommended that all wells containing standing water be disinfected to kill existing microorganisms. This can be accomplished by adding chlorine bleach at the rate of 1 gallon of bleach for every 500 gallons of water and is equivalent to a “shock” chlorination concentration of 100 parts per million chlorine. The chlorination process ensures that disease-causing microorganisms are not sealed in the aquifer. Step 4. Remove as much casing as possible. This will remove the conduit for carrying contaminants to the aquifer below. Step 5. Filling the well with plugging materials. Fill the well with plugging materials. The exact procedure for plugging will depend on well construction, depth, diameter, aquifer type, availability of materials, and the level of protection required. 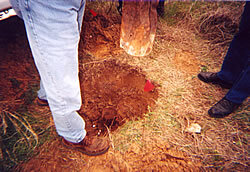 Figures 1-3 illustrate three different methods used to plug a well properly based on the well type (hand dug vs. drilled) and amount of water standing within the well (standing water>100 feet vs.<100 feet). Figures 1 and 2 provide actual examples of plugging a large diameter well completed in an aquifer and a small diameter well similar to the wells completed in many other aquifers within the state. Step 6. Complete and mail a State plugging form to the Texas Department of Licensing and Regulation. Complete and mail a State plugging form to TDLR at the address indicated below. 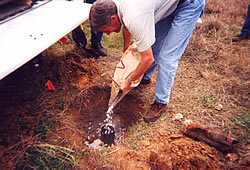 Comply with reporting and requirements of your local groundwater conservation district (if present). A state well plugging form can be downloaded from the TDLR website, www.license.state.tx.us. 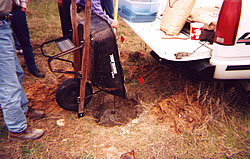 Plugging abandoned water wells was designed and produced by the Texas Groundwater Protection Committee’s Abandoned Water Well Closure Task Force in fulfillment of requirements given in 26.405 of the Texas Water Code. The effort was partially funded by the U. S. Environmental Protection Agency. While the information contained in the publication represents the contribution of each individual participating agency and group, the report as a whole is the work of the Committee and does not necessarily reflect all of the views and policies of each participating organization.